Double X Science: Everyday science: Why is the sky pink? Everyday science: Why is the sky pink? 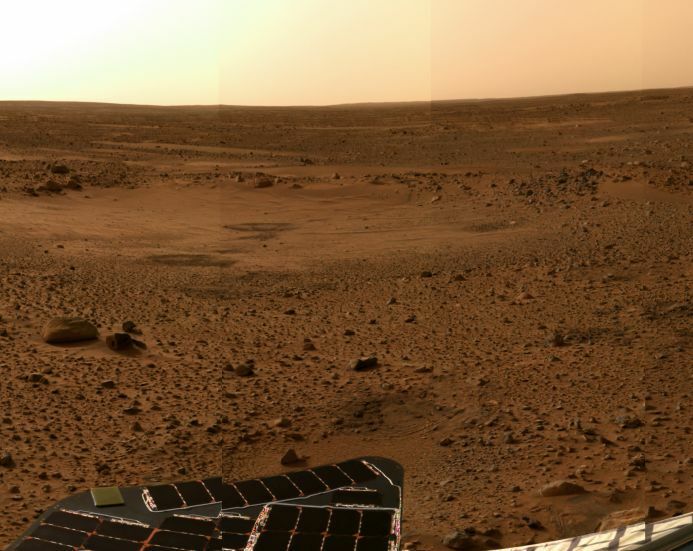 On Mars, the sky is pink during the day, shading to blue at sunset. What planet did you think I was talking about? On Earth, the sky is blue during daytime, turning red at as the sun sinks toward night. Well, it's not quite as simple as that: if you ignore your dear sainted mother's warning and look at the Sun, you'll see that the sky immediately around the Sun is white, and the sky right at the horizon (if you live in a place where you can get an unobstructed view) is much paler. In between the Sun and the horizon, the sky gradually changes hue, as well as varying through the day. That's a good clue to help us answer the question every child has asked: why is the sky blue? Or as a Martian child might ask: why is the sky pink? First of all, light isn't being absorbed. If you wear a blue shirt, that means the dye in the cotton (or whatever it's made of) absorbs other colors in light, so only blue is reflected back to your eye. That's not what's happening in the air! 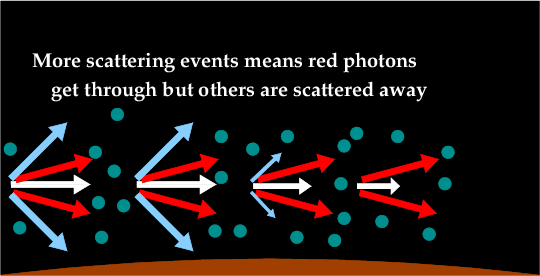 Instead, light is being bounced off air molecules, a process known as scattering. Air on Earth is about 80% nitrogen, with almost all of the rest being oxygen, so those are the main molecules for us to think about. As I discussed in my earlier article on fluorescent lights, atoms and molecules can only absorb light of certain colors, based on the laws of quantum mechanics. While oxygen and nitrogen do absorb some of the colors in sunlight, they turn right around and re-emit that light. (I'm oversimplifying slightly, but the main thing is that photons aren't lost to the world!) However, other colors don't just pass through atoms as though they aren't there: they can still interact, and the way we determine how that happens is again the color. The color of light is determined by its wavelength: how far a wave travels before it repeats itself. Wavelength is also connected to energy: short wavelengths (blue and violet light) have high energy, while long wavelengths (red light) have lower energy. When a photon (a particle of light) hits a nitrogen or oxygen molecule, it might hit one of the electrons inside the molecule. Unless the wavelength is exactly right, the photon doesn't get absorbed and the electron doesn't move, so all the photon can do is bounce off, like a pool ball off the rail on a billiards table. Low-energy red photons don't change direction much after bouncing–they hit the electron too gently for that. Higher-energy blue and violet photons, on the other hand, scatter by quite a bit: they end up moving in a very different direction after hitting an electron than they moving before. This whole process is known technically as Rayleigh scattering, for the physicist John Strutt, Lord Rayleigh. Not every photon will hit a molecule as it passes through the atmosphere, and light from the Sun contains all the colors mixed together into white light. 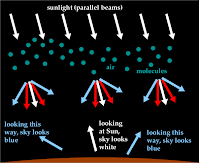 That means if you look directly at the Sun or the sky right around the Sun during broad daylight, what you see is mostly unscattered light, the photons that pass through the air unmolested, making both Sun and sky look white. (By the way, your body is pretty good at making sure you won't damage your vision: your reflexes will usually twitch your eyes away before any injury happens. I still don't recommend looking at the Sun directly for any length of time, especially with sunglasses, which can fool your reflexes into thinking everything is safer than it really is.) In other parts of the sky away from the Sun, scattering is going to be more significant. The Sun is a long way away, so unlike a light bulb in a house, the light we get from it comes in parallel beams. If you look at a part of the sky away from the Sun, in other words, you're seeing scattered light! Red light doesn't get scattered much, so not much of that comes to you, but blue light does, meaning the sky appears blue to our eyes. Bingo! Since there is some green and other colors mixed in as well, the apparent color of the sky is more a blue-white than a pure blue. At sunset, light is traveling through a lot more air than it does at noon. That means every ray of light has more of a chance to scatter, removing the blue light before it reaches our eyes. What's left is red light, making the sky at the horizon near the Sun appear red. In fact, you see more gradations of color too: moving your vision higher in the sky, you'll note red shades into orange into yellow and so forth, but each color is less intense. So finally: why is the Martian sky pink? 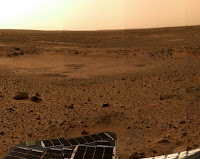 The answer is dust: the surface of Mars is covered in a fine powder, more like talcum than sand. During the frequent windstorms that sweep across the planet, this dust is blown high into the air, where light (yes) scatters off of it. Since the grains are larger than air molecules, the kind of scattering is different, and tends to make the light appear red. 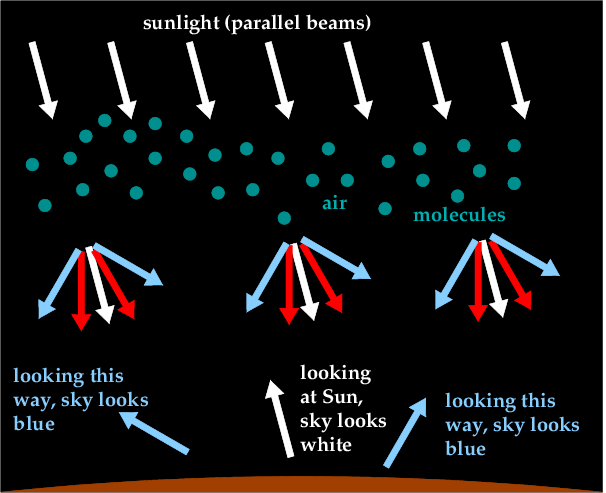 (Actually, the sky's “true” color is very hard to determine, since there is a lot more variation than on Earth.) When there is less dust in the atmosphere, the Martian sky is a deep blue, when the Sun's light scatters off the carbon dioxide molecules in the air.